Study for a qualification in ITIL Planning, Protection and Optimization (PPO) by taking an online training course from 4PA! Why Study ITIL PPO with 4PA? This eLearning course contains all the learning materials you need in order to prepare for the ITIL Planning, Protection & Optimization. Our course has been accredited by PeopleCert, who are licensed by AXELOS as an Examination Institute for the ITIL® Planning, Protection & Optimization Certificate in IT Service Management. In addition to the resources provided, the examination guidance recommends that candidates should complete at least 30 hours and 30 minutes of personal study. Thinking of sitting the ITIL Planning, Protection & Optimization Exam? On this page, you will find everything you need to know! In order to achieve this ITIL Intermediate qualification, you must pass the ITIL® Planning, Protection and Optimization Certificate in IT Service Management exam. 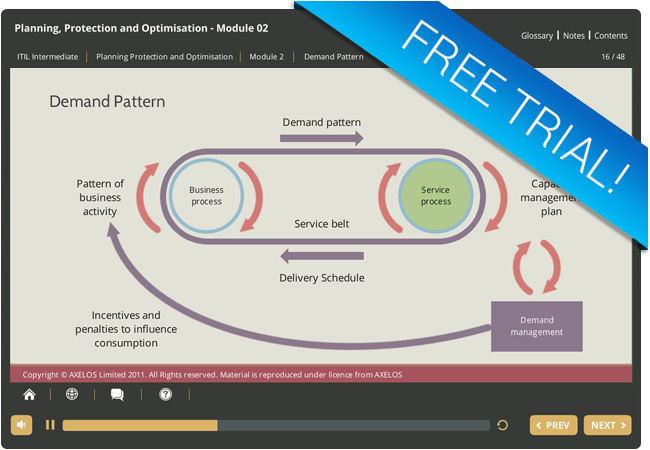 Why not try out a free trial module from our ITIL Planning, Protection and Optimization eLearning course! This ITIL Intermediate trial module will provide you with an introduction to PPO and includes the basic purpose and objective from service design and service strategy in support of PPO within a lifecycle context. Like the full ITIL Planning, Protection & Optimization (PPO) eLearning course, you can access this free trial module from any device whether you are at home, at work, or on the move!